Recently, on the Naturalistic Paganism Yahoo discussion group, a new member asked what to make of a Pagan author who claimed to have traveled to Faerie. His question was basically this: Should we assume this author is speaking poetically? Or should we conclude he is insane? * This question can be applied to just about any religion, from Pagan fairies to Christian angels to indigenous ancestral spirits. 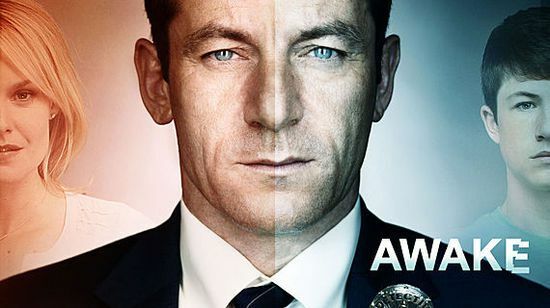 The discussion the followed reminded me of a TV series I watched a few years ago called “Awake”, about a police detective (Britten) who is living two alternate realities. He’s in a car wreck with his wife and son, and either his wife or his son die, depending on what reality he is in. After the wreck, every time he goes to sleep, he switches to the other realities. Neither reality seems like a dream to him. (The two realities are filmed with an orange or blue/green tint to designate which reality he is in.) Little things are different in each reality. And things that happen in one reality give him clues to things going on in the other reality. It may be a clue to help him solve a case or an insight about how to better connect with his son or wife. My wife is a therapist herself, and she leans more in the direction of Dr. Lee’s “reality-focused” approach. She tries to give her client’s what Dr. Phil calls “wake up calls”, to show them that that they are doing is not really working for them. But I wonder, when someone is caught in a “fantasy”, is it effective to just tell them that what they experience as reality is not in fact reality? Dr. Evans’ “meaning-focused” approach, in contrast, works from within the fantasy and tries to find its meaning. My wife would counter that insight into the meaning of one’s reality is all well and good, but it takes us nowhere unless there is a corresponding change in reality, i.e., in behavior. I agree with that, but I sometimes feel like the reality-focused approach is so caught up trying to prove whose version of reality is “real” and misses the meaning of our experience. What is point of striving to strip all “fantasy” from our lives, if in the process we also strip all meaning from it? I think the reality perspective is very important. Sometimes we are so stuck in our behavior patterns, which are not working for us, and we don’t see how we are responsible for our own life circumstances. We are, in a sense, not even aware of our own reality. And sometimes we need to be made aware of the reality of other people—otherwise we become narcissists. I have bounced back and forth between the two approaches both in my writing and in my private life. In my writing, if I’m talking or writing to a reality-focused audience, I try to emphasize the meaning-focused perspective, and when I am writing to a meaning-focused audience, I try to emphasize the reality-focused perspective. In my personal life, I move back and forth as well. On the one hand, I don’t want a realty-focused perspective taking the lead when I am participating in a Pagan ritual or when I’m trying to make sense of a spiritual experience. I think this is why a lot of atheistic and naturalistic Pagans like me have trouble getting down with ritual (and some avoid it altogether). On the other hand, I think too many Pagans seem to be living in the meaning-focused perspective, and the result is an anti-critical mindset and a disconnection from reality. This often manifests as a preoccupation with relationships with imaginary people and a lack of engagement with social justice (real people) and environmental activism (real matter). I think being able to move intentionally between the two perspectives is the ideal. Britten moves back an forth between his worlds, but the transitions are involuntary, and he can’t tell which is which. This may be the definition of insanity. Ideally, one could move intentionally between the two modes of being, suspending disbelief while operating in the meaning-mode, while distinguishing fantasy from reality when operating in the reality-mode. So are people who see fairies insane? Or are they poets? Both may see fairies (or angels or wha thave you), but distinguishes poets (and prophets) from madmen is this ability to move back and forth between the two modes of consciousness. The swimming metaphor is an apt one for religious experience as well. We need to be willing to plunge into the waters of religious experience, but we also need to be ability to swim to side and get out of the water when necessary. The plunging in corresponds with the meaning-focused mode of consciousness, while getting out of the water corresponds with the reality-focused mode of consciousness. I think the key to a healthy religious life is the ability to intentionally move back and forth between the two. * He also considered the possibility that the author was lying. One of the people who responded suggested that the author might be lying as a way of “tricking” initiates into a mystical experience. That’s an interesting possibility, but I think it’s just another way of saying the person is speaking poetically. Wasn’t it Plato who said that all poets are liars? I believe we can submerge ourselves deliberately in a fictive context of meaning while not becoming untethered from reality. This is why I encourage folks in Atheopaganism to develop “modern mythology” about their local landscapes, to reenchant the land with metaphors and teaching stories instead of just having them be insensate. Being aware of where reality stops and fantasy begins is a core skill, but we can still “immerse ourselves in the movie” of a storied experience. I didn’t realize there was an Atheopaganism YouTube channel! That’s cool! There’s not a whole lot there right now, but it does exist! You might enjoy the novel Woman on the Edge of Time, about a woman who is bouncing back and forth between the present and the future. (A la Billy Pilgrim from Vonnegut’s Slaughterhouse-Five – I just never cared for Vonnegut’s novel). Anyway in Marge Piercy’s version the woman is institutionalized, because if anyone experiences reality different from the norm they must be insane. One could argue that human ideas like love, good, and happiness can also be connected to changes in brain chemistry, but I doubt this participant would call THOSE worthless. Agreed. Although, those experiences usually have real world referents, like the people we love, the actions and things we call good, and the events that make us happy. The phenomena that we call fairies and spirits may also have real-world referents, e.g. trees, rocks, rivers. I like this analysis. I think I’m more meaning-focused, but I also check into the reality channel fairly frequently. I maintain some sort of synthesis between the two, but I don’t have a helpful metaphor to explain how I create the synthesis — though I’ve always maintained that my beliefs are a working hypothesis to explain my experiences, so I think that’s how I maintain a balance. Yes. This. I have been explaining for years how I live my life, but this puts it beautifully. (I didn’t notice such a close connection with “Awake”.) Like Yew Tree, I work with synthesis and balance – and a mind open to experiences even when that means shrugging my shoulders over explanations. But I never lose sight of what consensus reality is telling me.